In , ThermoSoft entered our th year creating comfort with the healthiest, safest, close-to-body heat wherever it’s needed. We accomplish our mission by designing and manufacturing the most advanced heating elements utilizing our exclusive, patented FIBERTHERMICS® technology. More than 1,400,000 households in the U.S. and Canada enjoy warming products with FIBERTHERMICS inside! Like fiber optics, the Silicon Valley technology that transmits light across fibers for communication, FIBERTHERMICS conducts electricity across electro-conductive textile fibers for heating. FIBERTHERMICS is a breakthrough technology that provides distinct advantages compared to conventional metal wires or carbon heating elements. We know because our first generation heating elements were made with carbon. FIBERTHERMICS is well suited to a wide variety of industries and products because it easily replaces typical warming products and can be incorporated into new products where warming was previously considered impractical or impossible. 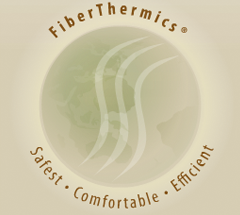 With its unique performance advantages including flexibility, strength, and fast warming, FIBERTHERMICS heating elements deliver the ultimate in comfort, safety and durability. New FIBERTHERMICS solutions are being created by ThermoSoft for our partners worldwide. We cooperate with manufacturers to custom design and manufacture heating systems incorporating our proprietary FIBERTHERMICS heaters into their OEM warming products. If you are an OEM interested in adding the superior performance advantages of FIBERTHERMICS technology to your warming products, we invite you to explore our customs solutions page to learn more about how we can cooperate to design and create the most innovative comfort warming systems and products. 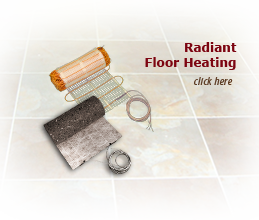 Visit our main ThermoSoft and partner electric radiant floor heating sites.